Since it’s Fall, I went with a nice, coffee-flavored Stout, whose name I cannot recall at the moment, but you can substitute your favorite Mocha Porter (Rogue makes a good one), brown ale or a time-tested Guiness. The recipe starts with sauteed onions and browned sausages in a rather large pot. 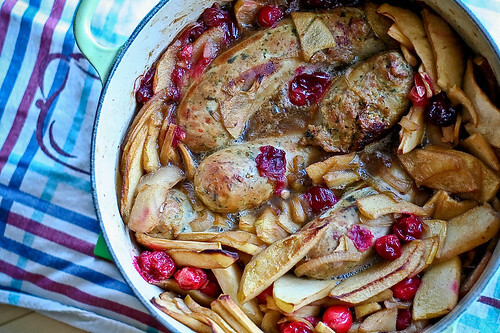 Add some sliced apples, pears, whole cranberries and a bottle of stout and pop it in the oven for an hour and a half and you’ve got a delicious Sunday supper. Make sure you’ve got some crusty bread to mop up the beer-y juices, or serve with roasted or mashed potatoes. Either way, you’ve got a hearty, healthy and really tasty meal. Feel free to use any variety of sausage, apple or pear that you have on hand. Preheat the oven to 350°. Set a large, heavy pot over medium heat and add the olive oil. Once it’s hot, add the onions and saute for 5 minutes, or until they begin to soften. Add the sausages and brown on each side, turning them continuously to prevent sticking, about 5 – 7 minutes. Add the apples, pears, cranberries and stout. Give everything a good mix and pop in the oven (uncovered) for 1 1/2 hours, stirring occasionally. When the hour and half is up, turn on the broiler and brown the top for about 5 minutes. This adds a nice color and makes for a prettier presentation. Serve with a loaf or two of crusty bread. Boozy sausage and autumn fruits? What’s not to love about that? This looks absolutely delicious. And I agree, cooking with beer makes this types of meal that much better. Try the Obsidian Stout from the Deshutes Brewery. Oh baby! Seriously tasty. And Obsidian Stout sounds like a nice companion. Mmmmmmm sausages. This looks so pretty. I wouldn’t have thought sausage could be that attractive (despite how much I love it). And so fall. Sounds great. Dried cranberries should be fine here. I used fresh because I didn’t want the dish to get too sweet. So in your case, I think I’d use just one apple, one pear and an extra onion or some shredded cabbage to keep it from tasting like dessert. Good luck! This was absolutely wonderful — thanks so much for sharing the recipe! It helped my boyfriend and me get through an ultra-stressful day of end-of-semester paper-writing. So quick and easy, and so flavorful. I’ll be making this again and again.